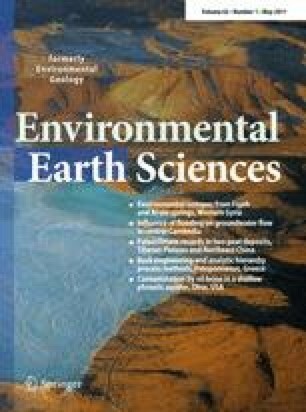 Environmental isotopes (δ18O, δD and 3H) in precipitation and groundwater were integrated for the description of groundwater discharge from the large karst springs of Figeh and Al-sin located in West Syria. The two springs are considered as the most important springs in this Middle East country due to their huge discharge. The δ18O values are −8.91 and −6.49‰ for Figeh and Al-sin, respectively. The regression line for both precipitation and groundwater is described by the equation: δD = 7.9δ18O + 19.7, which shows no evaporation during precipitation and suggests that the groundwater is mainly from direct infiltration of precipitation. The altitude gradients in the precipitation were estimated to be −0.23‰/100 m for δ18O. The main recharge areas are 2,100 and 750 m.a.s.l., for Figeh and Al-sin springs, respectively. The tritium concentrations in groundwater are low and very close to the rainfall values of 4.5 and 3.5 TU for Bloudan and Kadmous meteoric stations, respectively. Adopting a model with exponential time distribution, the main residence time of groundwater in Figeh and Al-sin springs was evaluated to be 50–60 years. A value of around 3.9 and 4.2 billion m3 was obtained for Figeh and Al-sin, respectively, as the maximum groundwater reservoir size. The author would like to thank Prof. I. Othman, Director General of AECS for use of their facilities during this study. We are also grateful to W. R. Agha and S. Rammah for their helpful comments and useful discussion. The author thanks the staff of the laboratories at the AECS for their cooperation in performing the isotopic and chemical analyses.